As I was unpacking a shipment of children's clothes I received today, I remembered something (else) I learned as a (surprise) foster mom. The 6-year-old girl loved to dress herself; as we know, when kids dress themselves it can sometimes lead to gasp-you-are-not-going-to-school-like-that moments. I quickly figured out if I bought her clothes from a handful of coordinating colors, she could dress herself and minimize the damage. Whenever I purchased her clothes, I bought pinks and purples (her favorite) and chocolates and blacks. These were her main colors; anything else in a different color had to coordinate or be of a similar shade strength as the main colors. Does this make sense? I wish I knew the terminology to describe this. I intuitively know this, perhaps you do, too. If not, google to find blogs or websites that explain color wheels or ask a well-dressed friend what colors best suit you. You can do this for husbands, too. Er, I mean adults. 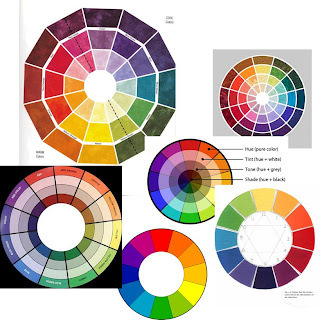 (wink wink) Buying from a handful of colors in similar shades or tones helps eliminate the "need" to buy a pair of pants to go with "that one shirt" that doesn't go with anything else the husband you own. You can also cut down on those harried mornings when you are trying to get out the door but half your wardrobe is still in the washer and what's left in the closet doesn't coordinate with each other. For myself, I prefer browns, reds, and black. Splashes of hot pink and teal are my second-string color choices, which also coordinate well with my main colors. 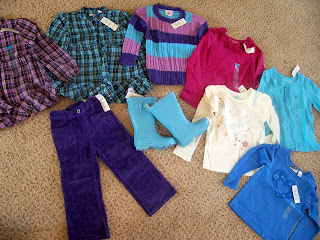 For my toddler daughter, I choose a base wardrobe of pink and blues (purple obviously being a blend of the two) when I purchase clothes for her. This doesn't mean that she (or you) will get stuck in a color rut. Take for example my daughter's clothes in the photo. Some other colors she can also use (such as in accompanying hat, scarf, belt or shoes) are black, dark brown, denim, whites, creams, and certain reds or pinks. And of course, I can get her a dress in any other color since it will most likely not be paired up with anything else in the closet. I admit this tip is harder to apply with hand-me-downs that can come in a rainbow of colors, which we receive also, but it is not impossible. But definitely, when you're going to put a dollar toward your wardrobe, go for something that you will be able to match or mix well with most of your clothes. You will save hard-earned money, shopping time, and dressing frustration in the short and long run. Or you can go with the "I'm allowing my kid to be a free-spirit so she can wear whatever she wants, no matter how horribly it clashes" attitude. It saves time, though there will be some days you have to repeat that mantra every time you look at her outfit.